Hockey has provided fans with many unbelievable moments that we didn't think were possible, like Jordan Eberle scoring against Russia at the World Juniors to keep Canada alive or Darry Sittler recording 10 points in one game. The impossible and rarely before seen happens in hockey, and that's one of many things we love about the sport. Wednesday night, fans in Erie were treated to one of those moments thanks to Dylan Strome. 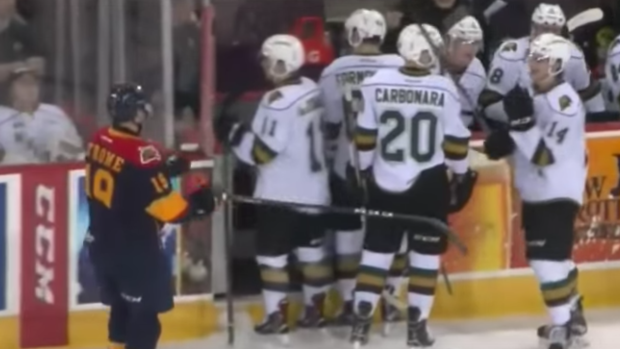 In the third period of Erie's game against the London Knights, Brandon Crawley stole Strome's stick right out of his hands. Rather than going to the bench to get a new stick, Strome decided to pick up Crawley's stick and play on. Lo and behold, the Coyotes prospect ended up scoring with his opponent's stick and he celebrated with it before giving it back to Crawley. We don't know if we've ever seen something like that before, which is totally understandable considering most players would go off or get another stick from the bench. Strome's quick thinking, though, led to one of the best plays of the year to say the least. Erie ended up smashing London 5-1 and Strome was the first star of the game thanks to a three point night.